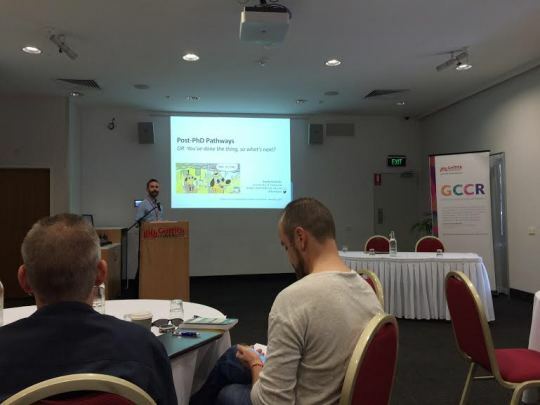 This week I was at the Griffith Centre for Cultural Research (GCCR), participating in a postgraduate research symposium and summer school. It was a terrific few days, organised by postgraduates for postgraduates. I did my PhD at Griffith, attached to the GCCR, so it was a bit of a homecoming for me, and it was really great to catch up with old colleagues and friends. Huge thanks go to the organising committee and the GCCR for flying me up and hosting me. This was the seventh year the event has been run, and I was on the very first organising committee, so it was just excellent to see how it has evolved and expanded over the years as the next generation has made it their own. I was given a pretty wide brief with my talk, and was asked to share my experience as a Griffith graduate post-PhD. I was asked by a few people for a copy of my slides, so I thought I’d put them up here with some context. I’ve written before about the kind of things I did during my PhD to prepare me for an academic job in the social sciences. I covered some of that in my talk this week, but I also went beyond that to consider: the academic job market over the past five years, developing a post-PhD research agenda, and entering into the competitive grant space. I shared selection criteria for the job I’m in now and also engaged with Looser’s concept of the shadow CV. My slides are below. Thanks to this Buzzfeed article by Jessica Misener for the PhD student memes. Thanks also to Ariadne Vromen for sharing some of her own slides on a similar topic with me, providing some much-needed inspiration. There were also many links and references to the terrific Thesis Whisperer and Research Whisperer sites. Finally, thanks to some fab peeps on Twitter for tweeting out some good advice to HDR students considering academic careers. The take-home message from the advice over the couple of days I was there was that there are lots of things you can do to prepare, but there are also many elements of an academic career out of your control. You have to be versatile and ready to consider a range of post-PhD options. Thanks to everyone who contributed. Tagged academia, careers, jobs, PhD, sociologyBookmark the permalink.